Lightly spread all the slices in 1 bag Waitrose Ascot Thin Sliced Brown Loaf with Lurpak Lighter Spreadable. Use half the loaf to make sandwiches using a 100g pack Waitrose No Added Water British Ham and spread the other half of the loaf with the contents of a 170g tub Waitrose Sandwich Fillers Tuna Mayonnaise. 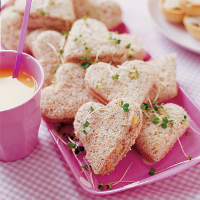 Sandwich together in 2 or 3 layers of bread, then stamp out heart and diamond shapes using cutters (if you haven't got any, make templates from stiff cardboard and cut the sandwiches out using a sharp knife). Serve on a platter garnished with cress.